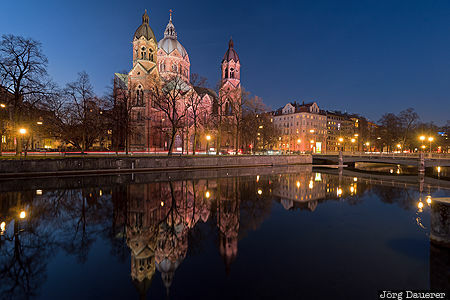 The church of St. Lukas and its perfect reflexions in the calm water of the river Isar seen at the blue hour just after sunset. The church of St. Lukas is in the Lehel area of Munich, the capitol of Bavaria in the south of Germany. This photo was taken in the evening of a cloudy day in December of 2015. This photo is part of the exhibition Blue Hour (October 2016). This photo was taken with a digital camera.